Tropical greenhouses, steamy windows and shaded (Japanese) gardens in Leiden, the Netherlands. Spiral bound photobook, A6 format, 32 pages. 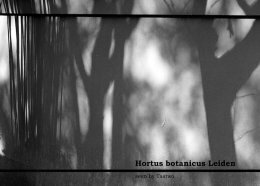 Part of the book's content is included in the Hortus botanicus gallery.